RANGOON — As the sun sets on the skyline of Burma’s former capital, small trucks and trolleys loaded with cooking pots big and small flock in to the city’s busiest areas from all directions. The pavements and streets, crowded with cars and pedestrian during the day, are taken over by large stoves and small tables and chairs. The voices of street vendors calling customers rise with the smoke and mouth-watering smells. These small stalls serve everything from the Burmese signature dishes—fish noodle soup known as mohinga, coconut milk noodles and pickled tealeaf salad—to Chinese dim sum, Japanese Sushi and Korean-style barbecue. There is no shortage of customers enjoying the selection, but consumer advocates say as many as 80 percent of street food stalls in Rangoon do not meet basic hygiene standards. For many a Rangoonian, these stalls are the gourmet corners to sit in and chat with friends, after the stressful working hours. The price for a plate or small bowl of yummy food, usually about 500 to 1,500 kyat, or not more than US$1.50, is low enough to attract consumers, despite any misgivings they may have about the safety of the food. “I’m happy to go around and have some street food as I do not have much time to cook after work, these stalls save my time, as well as money because I can have tasty food at a reasonable price,” said a sales girl at an electrical store in downtown Rangoon. Busy areas around City Hall, China town, Myaynigone and Heldan Junction are the most popular places to get street food for Rangoonians young and old. At a crowded mohinga stall in the heart of the city this week, the reasons for concerns over the hygiene if Rangoon’s street food were clear. A young girl rushed to a messy corner, where dirty dishes piled up near a small plastic bowl filled with soapy water, reddish-yellow oil and pieces of coriander leaves floating on the surface. The girl dipped plates and bowls into the murky water, cleaning the dishes briefly with a small piece of sponge. After a quick final dive into another plastic bowl filled with more opaque water, the dishes were ready to serve their duty again. At a small counter, a shop keeper was busy preparing packages for takeaway. With bare fingers, she placed noodles into small polythene bags and poured hot soup into another bag after receiving torn, grubby bills from customers. 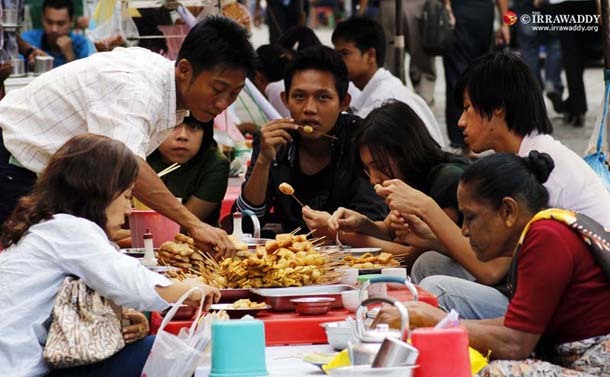 The Rangoon-based Consumer Protection Association (CPA) insists that street food is often not safe to consume, and venders need food safety education. “Nowadays, there are many fancy foods and fast foods, including various kind of traditional food, sold at those street stalls. Since they can’t invest much in their products, they usually use cheap commodities, for example palm oil, and using a lot of artificial flavors”, Soe Kalyar Htike, the CPA information department secretary, told The Irrawaddy. According to research conducted by the CPA recently, more than 80 percent of the more than 1,000 street food stalls in central Rangoon are not hygienic and are selling unhealthy foods. “Both consumers and vendors need to be educated for better hygiene and healthy foods. This is not only the problem of the government. The government has a lot to do, but we think they will not be able to handle this issue for nationwide. NGOs need to create awareness about this as well,” Soe Kalyar Htike said. To address the poor standards, the CPA is starting an education program for schools, to teach children about food safety. Another NGO, the Myanmar Restaurant Association, is also planning a project to choose 12 street-side stalls to hold up as models of good hygiene. The association is going to support licensed stalls in City Hall-approved areas, providing vendors with disposable caps and gloves for free, while educating vendors of hygienic food preparation, he said.